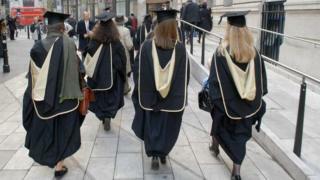 Young people in some of the wealthiest areas of England are 18 times more likely to go to university than those in the poorest, suggests new analysis. The charity Teach First compared official child poverty figures with university participation rates. In parts of Derbyshire, only one in 20 young people progressed to university in 2015, compared with more than 80% in parts of Buckinghamshire, it says. Universities Minister Jo Johnson said the figures were improving. "Recent UCAS data shows that young people from disadvantaged backgrounds are more likely to go to university than ever before, but we agree there is more to do," said Mr Johnson. The study drew on figures from the Higher Education Funding Council for England to highlight the area of Shirebrook in Derbyshire, where just 4.8% of young people started university in 2015. By contrast, the area with the highest university entrants was Gerrards Cross North in Buckinghamshire, at 87.2%. On average, the researchers found that in the most deprived 10% of postcodes about 20% of young people went to university in 2015, compared with about half of those in the least deprived 10%. In the report, Teach First says young people from the poorest backgrounds are constantly held back by social mobility hurdles their wealthier peers do not face. Figures from the Office of Fair Access to Higher Education (OFFA) show that universities in England spent £725m in 2015-16 on measures to help more disadvantaged students get into university - but the report asks if the money could be spent more effectively. It suggests that a proportion should be targeted on boosting participation in "hard to reach" communities, with schemes to encourage primary-aged children to aim at degrees. It also suggests that the government could encourage teachers to take jobs in schools in low-achieving areas by forgiving a proportion of their student loans. Teach First chief executive Brett Wigdortz said that "for those that choose that path, [university] gives them a huge range of social, cultural and economic benefits and, for the time being it's still the gateway for most high-status professions. "However, today there are still far too few disadvantaged pupils getting to university and completing their degree." Prof Les Ebdon, Director of OFFA said: "The grades young people get at school have a huge impact on their ability to access higher education. So it is a real cause for concern that the gap in attainment between pupils from different backgrounds can be seen from such a young age." Mr Johnson said the government's higher education reforms aimed to ensure that universities "look beyond just access - and focus on attainment, retention rates and readiness for the world of work. "This includes a new duty requiring universities to publish data broken down by background, to shine a light on where more must be done to tackle inequality. "The Teaching Excellence Framework will also explicitly look at how they are achieving positive outcomes for disadvantaged students." The study was written jointly with Credit Suisse's EMEA education foundation.